This is my fourth and final work visit to Frýdek-Místek in the past six months. Wondering where that is? 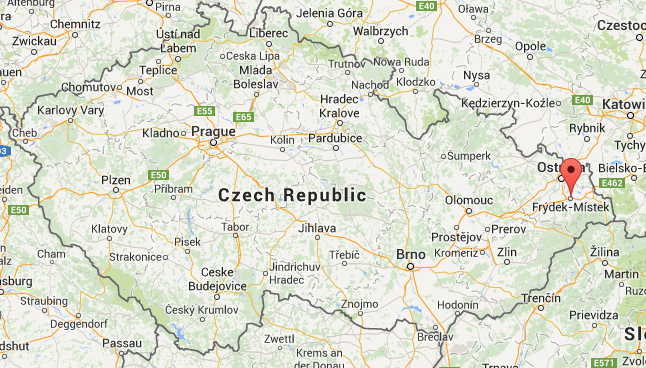 It is a tiny town in the Czech Republic, population 60,000, and perhaps 30 minutes from Ostrava. It used to be two independent towns, Frýdek and Místek, divided by the Ostravice River. But then the prince of Frýdek fell in love with the princess of Místek and they united the two towns. That is obviously a blatant lie, but it makes for a better story than the truth, which is that the Nazis forced the towns to merge during the occupation in WWII. Enough of the history lesson, because this is where it gets weird. There are a lot of Koreans in this town. In a big city this would, of course, not be weird. 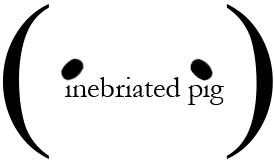 But this is Frýdek-Místek! The very first time I travelled here I immediately noticed the large amount of Korean men on the flight. What are they doing here, I wondered. Turns out the answer was simple, there’s a Hyundai factory nearby. 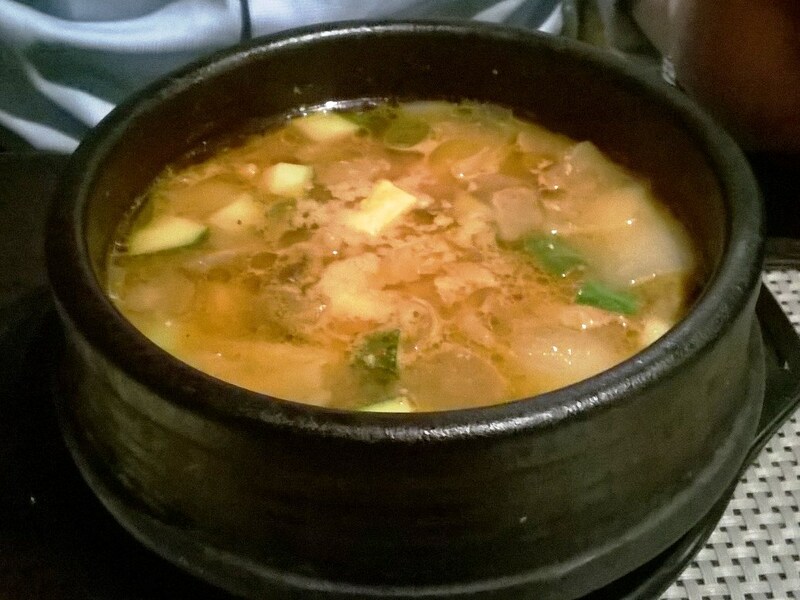 And then came the gem: where there are Koreans, there are Korean restaurants. So I go to Restaurant Benu every time I’m here. Last night my predictability in food choice was proven when a colleague that lives here decided to try to find us without calling and here was his reasoning process: they’re out for dinner. There’s two likely places, the Irish pub or the Korean. Selma is with them. They are at the Korean. Of course I’m at the Korean! I love Korean food! I always have kimchi and Korean chili sauce in my fridge at home. 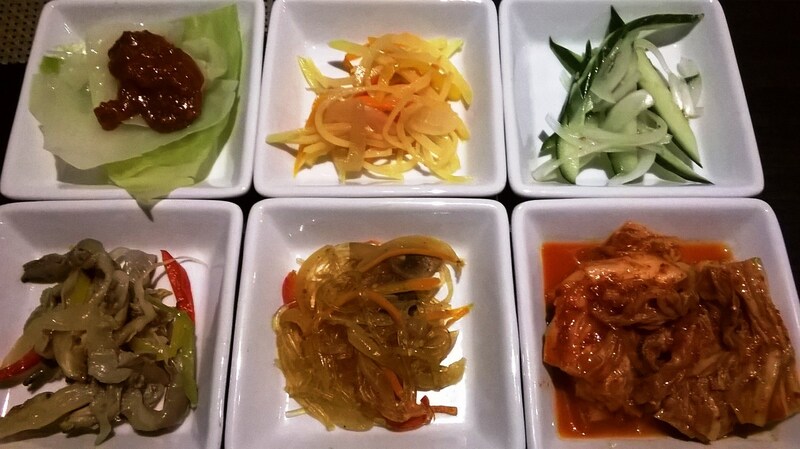 This evening’s dinner started with 6 different pickled items, including an awesome kimchi which was salty, pungent, tangy, sour, spicy and with a satisfying crunch. The other items were, going clockwise from upper left, cabbage with a salty bean paste on top, potato or some other root vegetable julienne, cucumbers with onions, kimchi of course, glass noodle salad, and mushrooms. 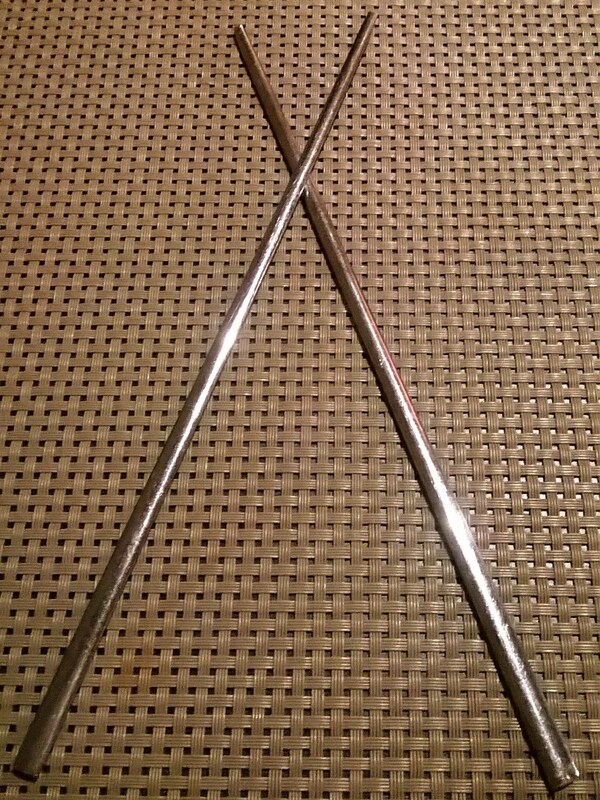 The chopsticks here are metal and flat shaped, which I had never seen before. Looks nifty but takes some getting used to because they feel a bit awkward in your hands at first; however, the grip on food is very good because of the flat ends. To drink I had local pilsner beer, Radegast. For our main course I had the kalbi, bbq beef short ribs. The bbq sauce was sweet and meaty, finger-licking good. The meat was a bit tough every now and then but the flavor made up for it. There were giant chunks of garlic on the hotplate, which I had one or two of, didn’t want to overdo it considering all the meetings planned the next day. 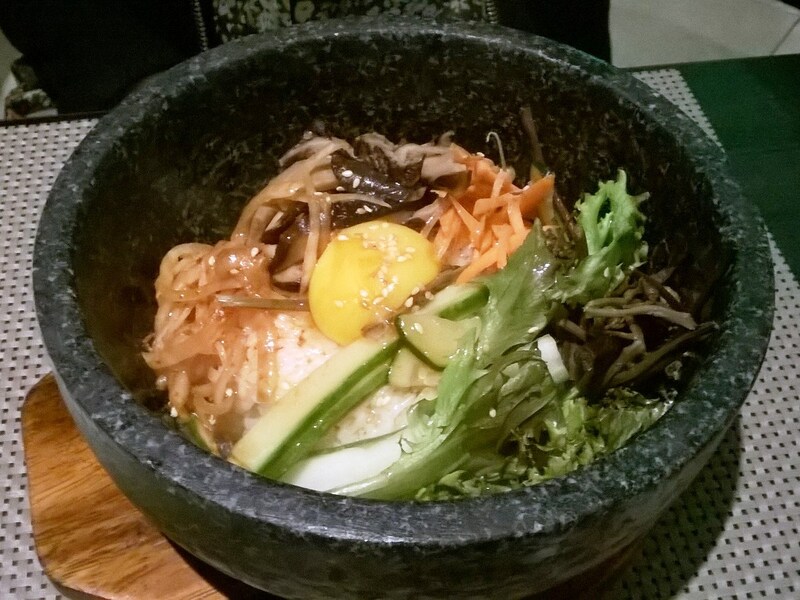 My colleagues ordered the beef doenjang jjigae, which is Korean soy bean paste stew with beef, and the vegetarian bibimbap, which literally means mixed rice. The soybean paste stew turned out to be a bit too spicy for my colleague. Actually, it wasn’t that spicy but he had the misfortune of eating an entire seed-filled green chili. As his face turned red I told him to eat plain white rice but he went for water instead. Mistake! Water, especially cold water, makes it worse. I pursed my lips and gave him a slow head shake and he finally followed my advice and stuffed his face with rice. A glass of milk would’ve been helpful as well. The experience traumatized him a bit, so I gave him half of my ribs and ate most of his stew, carefully avoiding the chilies as I wasn’t in the mood for milk. I also ordered another portion of the kimchi because I couldn’t get enough of it. It was a satisfying dinner. 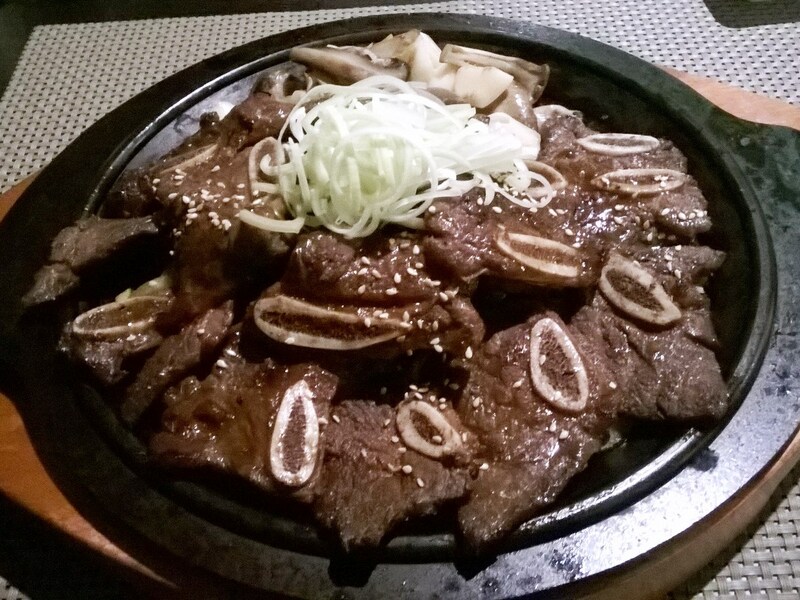 Not the best Korean I’ve ever had, but definitely good and of course a pleasant surprise when in Frýdek-Místek. So if you ever find yourself in this part of the Czech Republic, head over to the town square and have a meal here. As for the price, food in the Czech Republic is cheap, and this place is ‘expensive’ at 12-18 Euros for a main dish. 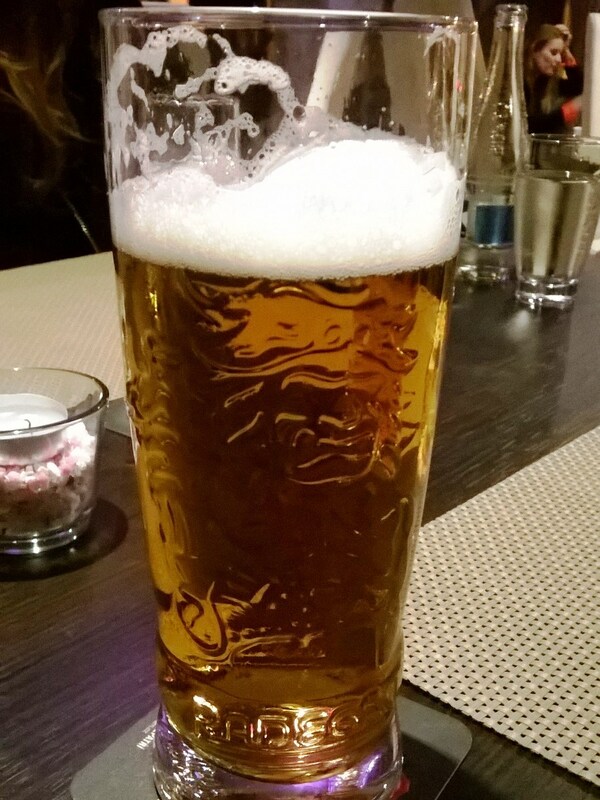 My half liter of beer was a mere 2 Euros.